What do we mean by equity? 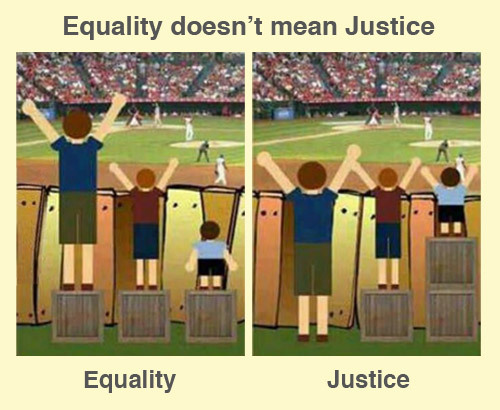 Working towards equity means interrupting inequitable practices, challenging biases, and creating inclusive school environments for all and removing the predictability of success and failure that currently correlates with any social or cultural factor discovering and cultivating the unique gifts, talents, and interests that every human possesses. These three equity and inclusion programs are described below. Since the 1970’s, California state law has required each public school site to have an elected committee that represents school staff and the community and is responsible for developing and reviewing an ongoing Single Plan for Student Achievement (SPSA). All parents and community members are welcome to attend SSC meetings. They are held the last Tuesday of every month from 5:15 – 7;00 pm. Inspired by indigenous values, restorative justice is a philosophy and a theory of justice that emphasizes bringing together everyone affected by wrongdoing to address needs and responsibilities and to heal the harm to relationships as much as possible. Several members of our staff have been trained in this tool and it is our first response to most problems. Much of the work of Restorative Justice is done through CIRCLES. At Chabot, we use Circles to build community and to solve problems both in and outside of the classroom. The circle process creates a distinctive kind of space for restorative dialogue. Circles are fashioned in such a way that interconnectedness, interdependence, and equality within the community are highlighted. Participants are encouraged to share a sense of mutual responsibility for the well being of the community and the individuals within it, and an understanding that what happens to one person affects all. In the circle, all participants, regardless of role or status, age or experience, are considered of equal importance, with an equal voice. Everyone in the circle is invited to speak and listen from the heart or to initiate silence. No one sits above or below others, or outside of the circle. The circle is inclusive. Even the circle keeper participates in the circle, in addition to facilitating the process. A circular seating arrangement and the use of a talking piece help define the process. While circles vary somewhat in style and structure, they all seek to cultivate a climate of mutual respect and caring that is value-oriented and heart-based, that engages the emotions as well as the mind.